0530 start - oh my gosh we don't do that very often, but it was worth it for a fantastic sail to St Barts. We had the engine on until we were clear of Antigua then the wind set in we sailed in perfect conditions for the next couple of hours before the wind eased and we put up the assy for a glorious few hours. I think this was our longest sail to date under the assy. As we approached St Barts we spotted another boat on the AIS - ah ha Spirit of Lusitania... big waves from Augusto and Dai followed by drinks aboard Askari that night. 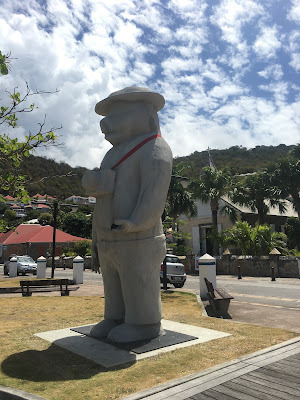 We had heard mixed reports of St Barts; the anchorage in Gustavia is so rolly and choppy that many of our friends have only stayed one night enroute to Sint Maarten. 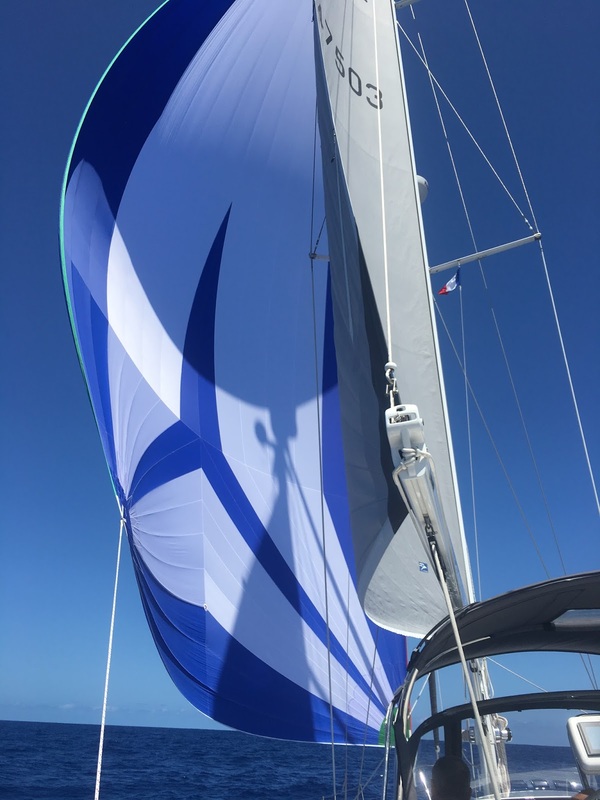 We had pretty calm conditions but it was still a bit of a rolly night, so next morning we cleared in, went to explore before catching up with Dai and Augusto for a lovely french lunch, before moving Askari to a really lovely bay called Columbiere. We arrived in the bay and spotted one mooring free, as we approached it a small rib whizzed up to it and grabbed it - seriously annoying, especially when I called out if they minded if we share and they refused even though they were only staying for an hour - hmmmmff!! We then anchored and had a lovely snorkel with turtles swimming all around us. Then a yacht arrived an anchored close by, just before the wind changed direction and they were soooo close - this wasn't our day for mooring. As they didn't seem too concerned so we moved just before sunset. However during the night the swell picked up and we actually were in a much better part of the bay than both of our first two choices - maybe Askari arranged it??? Not liking the swell we decided to head back to Gustavia and clear out the next morning, however when we got there we found a spot on on the town side of the bay that actually didn't have much swell and we really liked so we relaxed into St Barts and spent a couple more days. We read up on some dive spots and decided to give it a go. We ended up doing three amazing dives in Gustavia itself; the first spot we saw nurse sharks and turtles, then we went out to a hump just outside the entrance where we met a huge school of barracuda plus heaps of other big fish! Our final day in St Barths was at the private island of Ile Fourche - where we joined Spirit again and did another fabulous dive before having a reading afternoon snorkelling and drying off our dive gear. Independent diving on Askari was declared a success. Oh apart from when the retaining screw from our dive compressor rolled in the sea; anchored in 12 metres on went the dive gear and 56 minutes later he managed to find it!! Next morning we sailed to Sint Maarten - however we ended up in St Martin on the French side - ha ha another story!! So glad you liked St Barths! Your photos and commentary are superb. PS: lucky to see the whale!